Much of what is known of Aztec society comes from a book written by Bernardino de Sahagún, a Spanish friar living near what is now Mexico City. During the second part of the 16th century, Sahagún compiled a vast compendium on Aztec customs, entitled the General History of the Things of New Spain. The lavishly illustrated manuscript, whose three volumes are now kept in Florence, Italy, dealt in its sixth book with the complex methods and rituals of Aztec childbirth. Central to Aztec obstetrics, the General History explains, was the tlamatlquiticitl, or midwife. 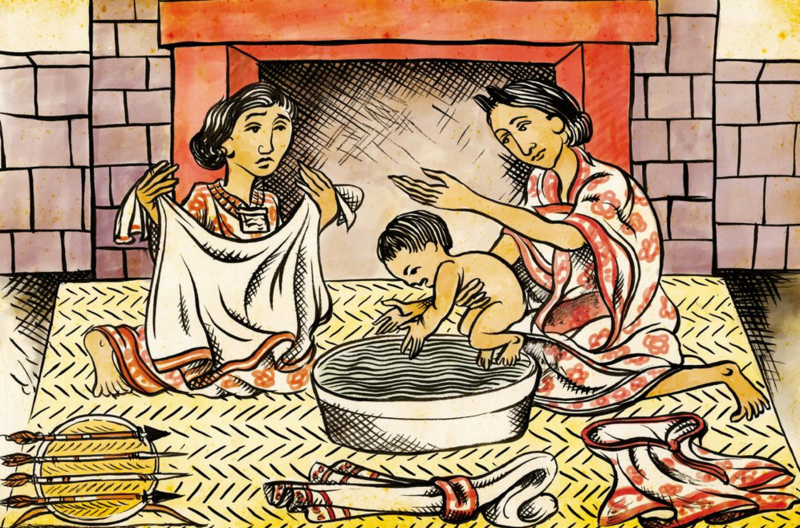 While noblewomen could expect to be cared for by a midwifery team, women lower down the social scale would also have access to the services of this key figure in Aztec society, who would monitor the pregnancy. When acquired in 1947 for the collection at Dumbarton Oaks in Washington, D.C., this statue of a goddess giving birth (above) was widely believed to be a pre-Columbian artifact representing Tlazolteotl, a complex Aztec goddess. An Earth deity, she also ruled over the areas of love, fertility, and lust. She displayed a cruel streak, causing madness among some mortals. But in her role as a childbirth deity, known as “the great woman in labor,” she showed a kinder aspect. Today some scholars believe this statue is a fake and more likely dates to the 19th century. Whatever the provenance, this figure did secure a place in history: Hollywood history. It was used as the model for the golden idol, which Dr. Henry “Indiana” Jones retrieves in the opening sequence of the 1981 blockbuster movie Raiders of the Lost Ark.